When it comes to jeans there always seems to be restrictive rules on how to clean them. Don't wash them, wash them but in salt water, sit in the bath while wearing them - it's all a confusing mess that doesn't seem to have a fixed answer. Luckily, Mr Black denim refresh came about to end any washing woes, and with our Mr Black discount codes, you can even get money off this ingenious product. There's always a fear of shrinking, fading or just generally messing up your jeans when you try to clean them. However, there's no need to have either faded yet clean jeans, or rank, perfectly coloured ones. You can get the best of both worlds with the garment essentials and denim refresh spray from Mr Black. 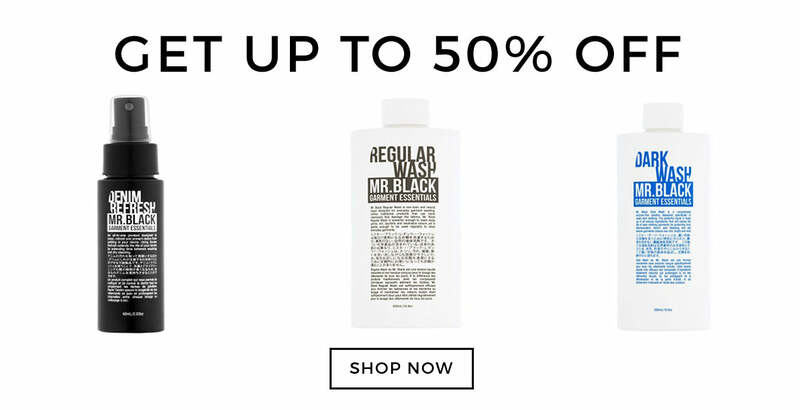 Not only that, but with our Mr Black voucher codes you can up to 50% off these handy products, making sure there's no reason not to keep your jeans in tip top condition. Keep up with all our future sales by signing up to our newsletter where you'll receive the latest editorial stories, news, coupon codes, as well as 10% off of your first order from The Idle Man. Plus, if you spend more than £5o on our website you’ll automatically receive free shipping. If you feel your friends would benefit from some money off our stock, then check out our Refer a Friend scheme. It's simple, and all you need to do is share your discount code on social media, or invite your friends via email, and we'll send them £5 to spend in store. You’ll then receive £5 worth of credit as well if your friend spends £30 or more in their first shop. Spend your days juggling classes and essays, and fancy a discount as a treat? With our Student Discount page, you can get 10% off Mr Black and plenty more brands with a valid NUS or student card. Still not enough? Then try waiting for one of our special double discount days and get up to 20% off! Mr Black grew from denim lover Ash Black's frustration at being told repeatedly that he shouldn't wash his jeans, but being offered no suitable alternative. Feeling that keeping your jeans clean was kind of necessary, he spent time creating a formula that wouldn't affect the integrity or colour of the jeans, but would effectively deodorise and clean them. The products were an instant hit, with people finally being able to refresh their, possibly kind of musty, jeans without compromising on quality. To make things even better we've got a whole load of Mr Black discount codes to give you money off these vital products.